I am very fond of this church for a number of reasons, not least because the only time I have been a godparent it was here at this church. 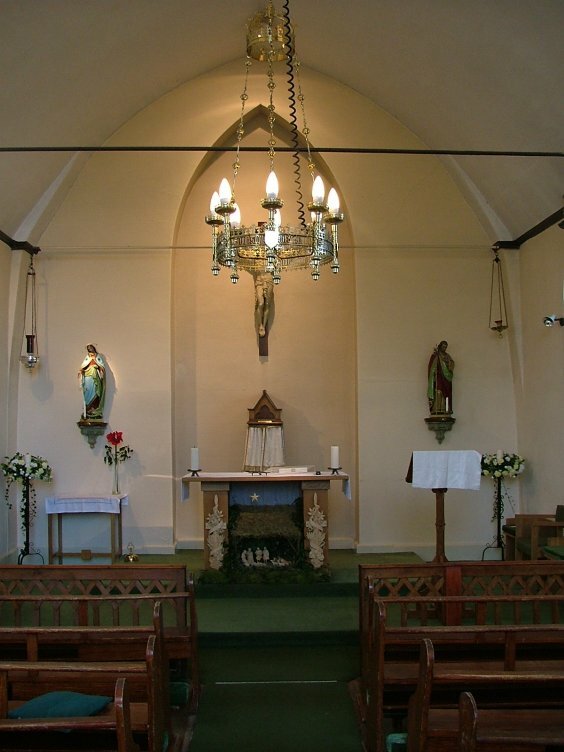 I also love it because rural Catholic churches in East Anglia are few and far between, and almost always have a good story behind them; as at Withermarsh Green, fifteen miles or so away, the church here is testimony to the strength of will of a local landed family, who maintained their Catholic faith throughout the penal years. Here, they were the Rokewoods of Coldham Hall, who married into the recusant wing of the Drury family in the 1570s, by which time Catholicism was already illegal under the firebrand bigotry of the virgin Queen Elizabeth I. She is remembered by local historians for her visit here in 1578; she was entertained with a feast at the Hall, but when her host refused to pledge allegiance to the new Church of England, she had him arrested on the spot. As at Withermarsh, the sacramental presence was maintained in the Hall chapel, but here there was this building as a priest's house from at least the 1580s onwards, the hinges and finishings of doorways dating from this period at the latest. 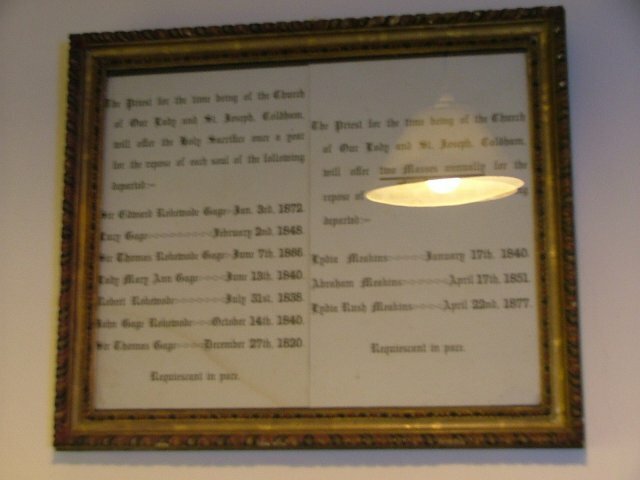 The Rokewoods were powerful enough to stave off the tariff of fines and imprisonments levied against those who subscribed to what they believed to be the One True Church; it would mean gaol for them, torture and death for their priest, if they could not do so. Because of this, and despite the dating of the present west end of the building at 1870, this is the oldest Catholic church in Suffolk. Of course, that isn't true, since all the medieval churches in Suffolk were built as Catholic churches, but you know what I mean. 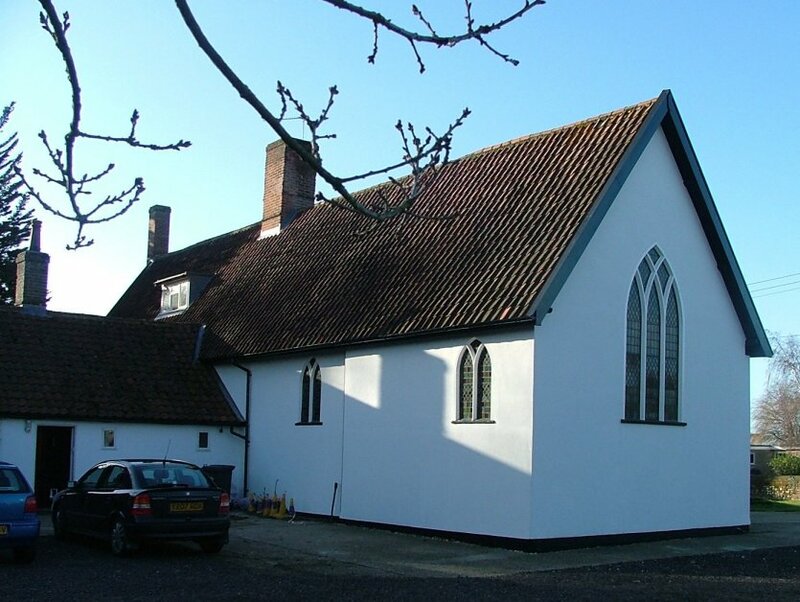 The church and presbytery form a row of three cottages; the two most easterly, which contain the presbytery and sanctuary, are 16th century, while the most westerly is the addition of the 19th century. They are rendered and painted in cool white, and the Y-tracery probably dates from the 1830s when the Catholic Church at last felt able to make itself more visible. 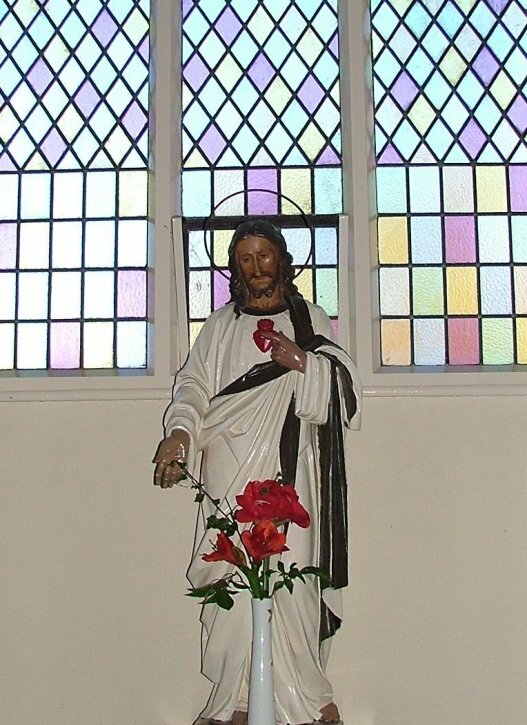 Shortly after this, a school was built to the west of the church, one of the few village Catholic schools in Suffolk. 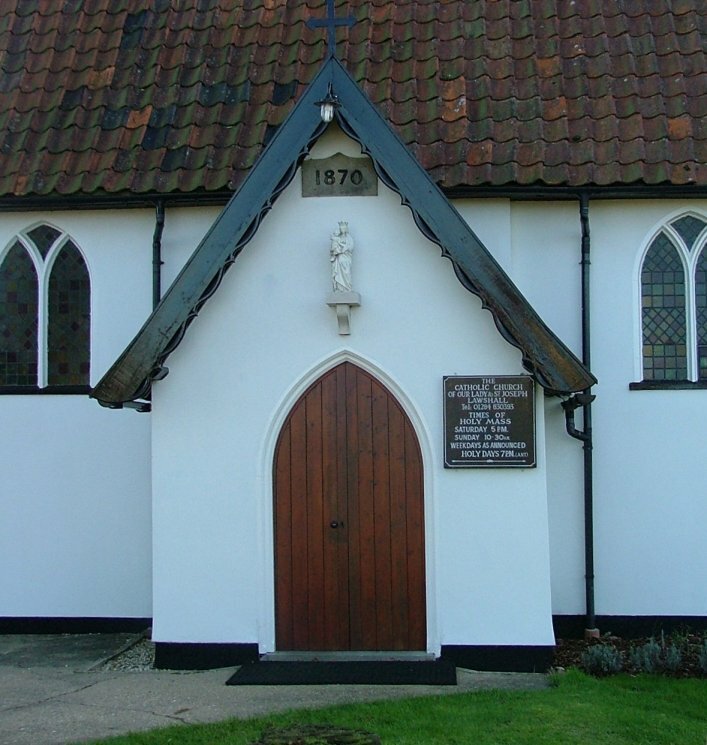 Probably half the residents of Lawshall and neighbouring Stanningfield were Catholic, and the village school thrived until 1949. The school building has now gone, but has left a rather curious and uncomfortable legacy - the benches in the church are the old school benches, and are thus low and narrow. 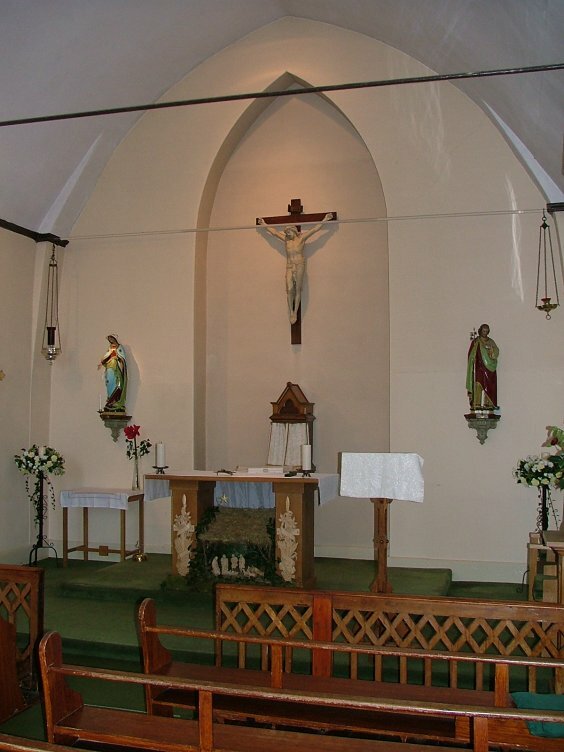 However, this tiny church has an average congregation of 120 on a Sunday, so there is no way they can be replaced with larger seats - people simply wouldn't fit. There are two war memorials; one of local people who fought, and another at the west of the church which remembers those who died. 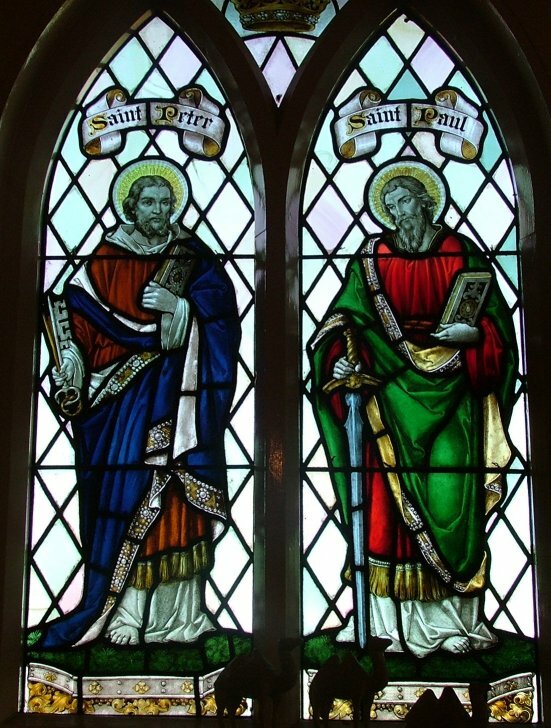 The only glass of note is a fine pairing of St Peter and St Paul on the south side of the sanctuary, which probably dates from the 1870s. The presbytery is very large, and I can vouch that it is very comfortable. It has been partly converted into the Martha House, a retreat centre for Priests of the East Anglia Diocese. 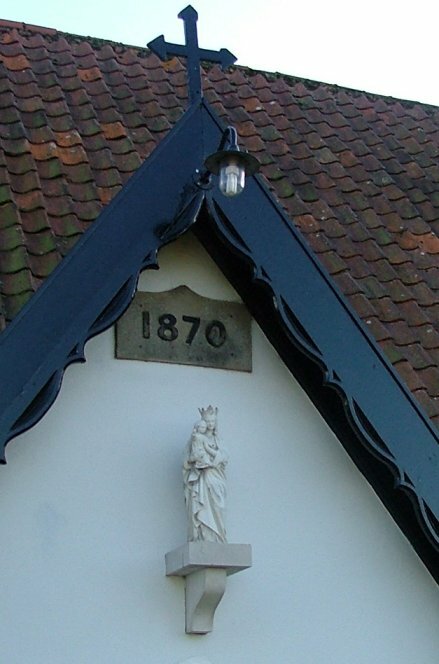 Technically, Our Lady Immaculate and St Joseph is not a parish church; it is a mission church within the parish of Bury St Edmund. Ironically, this will probably protect it from any downsizing that the Diocese misguidedly thinks is necessary as part of its Forward and Outward Together consultation exercise. The Rokewoods of Coldham Hall are no more, incidentally; the house was sold as long ago as the late 19th century. Today, in one of Suffolk's worst kept secrets, the Hall is inhabited by the former supermodel Claudia Schiffer.